Download Brother MFC-L2700DW Manual PDF - With its modern and compact design, the Brother MFC-L2700DW is the ideal multifunctional device for use in the workplace. Once integrated into the network via LAN or WLAN, it can be printed from multiple computers or via mobile devices, Apple AirPrint, Google Cloud Print and Brother iPrint and Scan. In addition to the paper cassette, the Brother MFC-L2700DW multifunction printer has a single-sheet feeder. In addition, you can easily use envelopes, special paper types or thicker media without having to remove the standard paper from the paper cassette. Stronger media are printed without deflection via the straight paper path. The Brother MFC-L2700DW is equipped with a generous 250-sheet paper cassette. This eliminates the need for frequent paper refilling, even with larger print jobs. At the same time, the printer's closed paper cassette protects your paper from dusting and yellowing due to direct exposure to light. With up to 26 ppm, the Brother MFC-L2700DW multifunction printer delivers high speed even for large print jobs. A print resolution of up to 2,400 x 600 dpi delivers excellent results that can be achieved in less than 8.5 seconds. Just one click in the printer driver and you can print A4 pages automatically on both sides, or you can create a handy A5 brochure from a multi-page A4 document using the brochure printing function. Connect the multifunction device Brother MFC-L2700DW locally via USB or connect it to your network via LAN or WLAN. Intelligent solutions such as web-based management are available for configuration and administration via the network. Or you can use the various possibilities to connect the Brother MFC-L2700DW via the network to your mobile devices, such as the Brother App iPrint and Scan, AirPrint or Google Cloud Print. Comprehensive driver support for Windows, Mac, and Linux round off the wide range of connectivity options. Brother MFC-L2700DW General Information, Control Panel Overview, Access Brother Utilities, Initial Setup. Brother MFC-L2700DW Paper Handling, Load Paper, Load, and Print using the Paper Tray, Set the Check Size, Change the Paper Size, Change the Paper Type, Recommended Print Media, Using Special Paper. How to print with Brother MFC-L2700DW, Print from Your Computer (Windows), Print a Document (Windows), Print on Both Sides of the Paper (Windows®), Print More Than One Page on a Single Sheet of Paper (N in 1) (Windows®), Printing on Envelopes, Thick Paper, or Labels, Printing on Plain Paper, Thin Paper, Recycled Paper, or Bond Paper using the Manual Feed Slot. How to Copy with Brother MFC-L2700DW, Copy a Document, Copy Settings, Copy Option, Copy Multiple Pages on Both Sides of the Paper, Copy a 2-sided Document Using the Scanner Glass, Copy Both Sides of an ID Card onto One Page. How to Scan with Brother MFC-L2700DW, Scan from Your Computer (Windows®), Save Scanned Documents and Photos to a Folder as a PDF File Using ControlCenter4 Advanced Mode (Windows®), Scan Using the Scan Button on Your Brother Machine, Scan Using the Scan Button on the Machine. 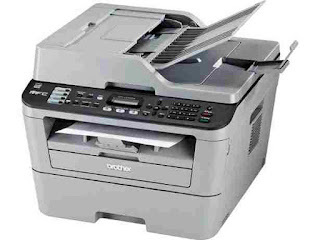 How to Fax with Brother MFC-L2700DW, Before Faxing, Set Your Station ID, Set Telephone Line Compatibility for Interference and VoIP Systems, Receive Modes, Store Numbers, Telephone Services and External Devices, Send and Receive a Fax Using Your Machine, Fax Using Your Computer (PC-FAX). Brother MFC-L2700DW Troubleshooting, Identify the Problem, Error and Maintenance Messages, Fax and Telephone Problems, Troubleshooting for Other Fax Problems, Print or Scan Problems, Document and Paper Jams, Find the Jammed Document or Paper, Clear the Document Jam, Clear the Paper Jam. Appendix, How to Enter Text on Your Brother Machine. 0 Response to "Brother MFC-L2700DW Manual"